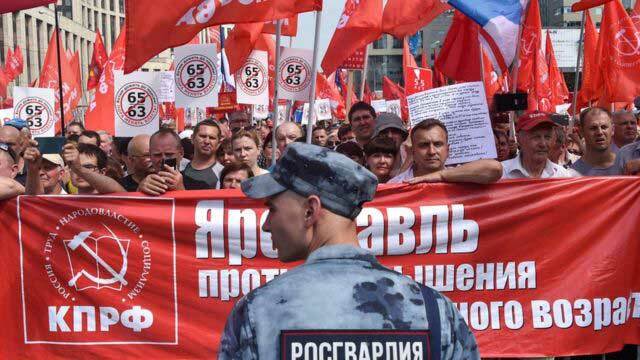 Moscow, July 28 (Just News): Thousands of people have taken part in protests in cities across Russia to express their anger at government proposals to raise the pension age. Demonstrators in the capital, Moscow, carried banners reading: "We want to live on our pensions, not die at work." The government says it wants to raise the pension age from 60 to 65 for men, and from 55 to 63 for women, to help cope with a shrinking workforce. But unions warn many people will not live long enough to claim a pension. Russian men have a life expectancy of just 66, while for women it is 77, the World Health Organization says. Some 12,000 people took to the streets of Moscow to protest at the controversial plans. Permitted rallies have also been taking place in dozens of towns and cities in far eastern Russia and Siberia. The national protests were organised by the Russian Communist Party (CPRF), but trade unionists and nationalists also participated in the demonstrations. There were red flags and other left-wing symbols. People chanted war songs. Communists tend to bring up the 1945 victory over Nazi Germany at almost every rally. Protesters carried slogans like: "We won't live that long" and "the government must go". Several activists dressed up in death costumes, with one bringing a skeleton and a scythe. They argue the reforms are a death sentence for Russian people. While 12,000 is not a big number for a city like Moscow, the rally is the biggest against pension reform in Russia to date. On Saturday, the leader of the CPRF, Gennady Zyuganov, told those gathered in Moscow that the government's pension plan was "a blow to every citizen in our country", AFP news agency reports. Protesters say the government should be taking the money from the rich and not "stealing" it from ordinary working people. Some three million people have signed a petition against the pension reform proposals, which have been backed by President Vladimir Putin's ruling United Russia party. The government's move has been described as the most dangerous and risky reform of President Putin's 20-year rule.